The Frugal Family Life: New $4/4 Right Guard Coupon = $.49 Bar Soap at Walmart! New $4/4 Right Guard Coupon = $.49 Bar Soap at Walmart! 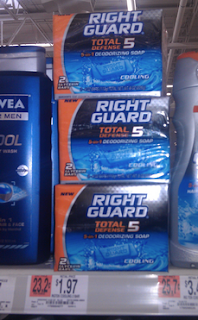 Here is a great $4/4 Right Guard Total Defense 5 Products Coupon! This one should definitely get us some good deals--maybe at Walgreens or CVS. But, we can also take it to Walmart to score the 2 packs of bar soap! Final Price = $3.88 for 8 bars of soap--or $.49 per bar!! Thanks, Raking in the Savings!